Hang gliding was his hobby - and a dream come true. 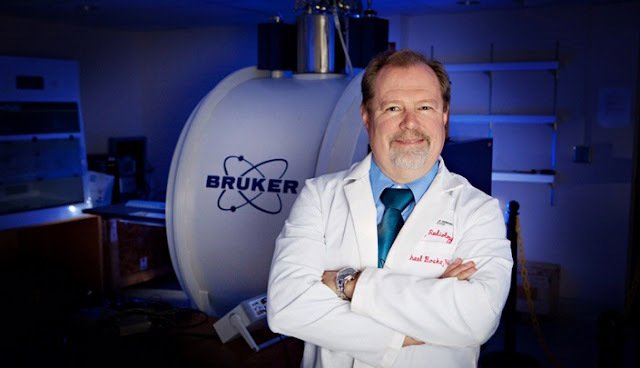 In a 2008 interview, Dr. Boska said, "As a child I always wanted to parachute, but when I heard about hang gliding in the early 1970s, I thought, 'that sounds even better.' "
As a pilot, Dr. Boska had flown hang gliders with and without power for nearly 40 years. 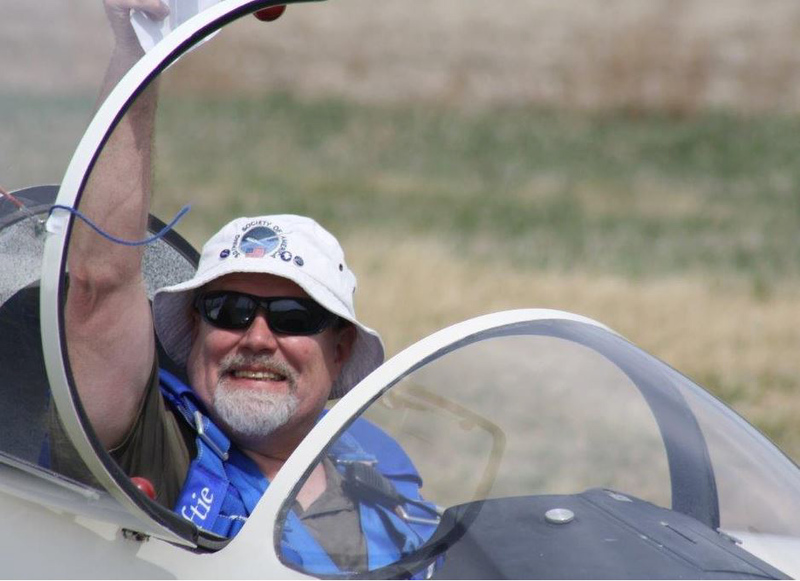 He particularly enjoyed soaring alongside eagles and Red Tailed Hawks, saying: "They are very curious and will come right up and fly with you during unpowered flights." Dr. Boska served as professor in the University of Nebraska Medical Center, Department of Radiology, director of the bioimaging core and vice chairman of radiology research, and worked to develop improved disease detection methods. On May 13, 2017, about 1520 central daylight time, an experimental AS+ LTD AC 4 glider, N358R, impacted terrain after the canopy opened during takeoff at Blair Municipal Airport (BTA), Blair, Nebraska. 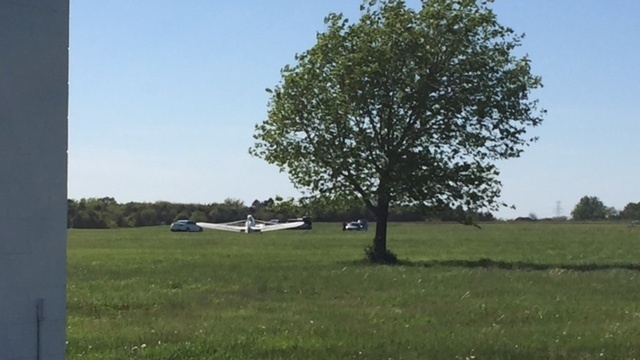 The private pilot received fatal injuries, and the glider sustained substantial damage. The glider was registered to and operated by the pilot under the provisions of Title 14 Code of Federal Regulations Part 91 as a personal flight. Visual meteorological conditions prevailed at the time of the accident, and no flight plan was filed. The local flight was originating at the time of the accident. 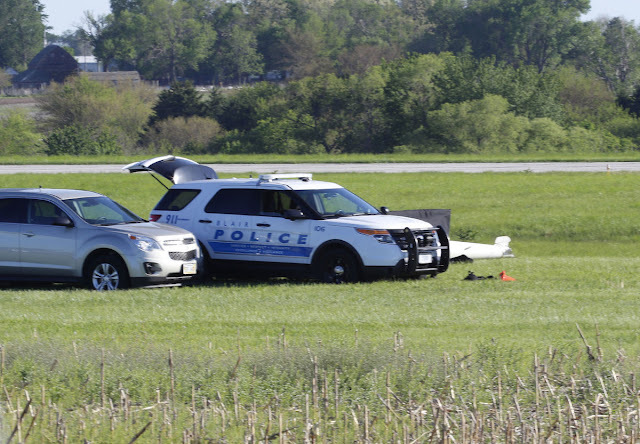 According to a Federal Aviation Administration (FAA) inspector who responded to the scene of the accident, the pilot belonged to the Omaha Soaring Club, and the club conducted its glider operations from a 2,000-ft-long grass strip that was parallel to paved runway 13 at BTA. On the day of the accident, the club was launching gliders from the northwest end of the grass strip. Club members positioned the accident glider on the grass strip, and ground crew connected and tested the towline release mechanism, which functioned normally. The towline was reconnected, and the ground crew signaled to the towplane that the glider was ready for takeoff. The pilot of the club's Piper PA-28-235 towplane stated that he observed the glider pilot perform a portion of the preflight inspection of the glider and that the glider pilot was very thorough with his preflight inspection. The towplane pilot further stated that the glider was just getting airborne when he felt two consecutive big tugs and saw the glider "banked to the left more than normal." He immediately felt a release of tension from the tow rope. Two witnesses stated that shortly after the glider's liftoff, they saw the glider's canopy rotate open and the pilot's white-colored hat depart the glider. One of these witnesses stated that he saw the glider pilot reach up with one hand to grab the glider canopy, and the glider then underwent "pilot induced oscillations." The witness said that the glider descended from a height of about 20 ft above ground level, impacted the ground, and the tail separated as the glider bounced "relatively high." The glider hit the ground again, the wings separated, and the fuselage rolled over and came to rest. The other witness stated that after the canopy opened, the glider pitched up abruptly and then pitched back down. The witness further stated that the glider hit the ground "flat but hard" and then "flipped over on its top." 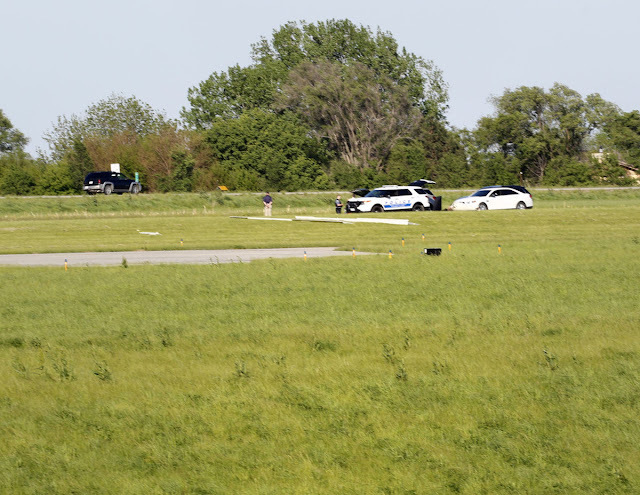 Postaccident examination of the accident site by the FAA inspector revealed a 750-ft-long wreckage path on the grass strip that began with a white hat and ended at the fuselage. The white hat was about 750 ft from the beginning of the grass strip. The initial impact area, the tail section, a secondary impact area, the wings, and the fuselage were about 900 ft, 1,000 ft, 1,110 ft, 1,1,450 ft, and 1,500 ft, respectively, from the beginning of the grass strip. The glider's side-opening canopy was separated from the fuselage and found along the wreckage path. The canopy and canopy frame had fractured in several pieces due to impact. The canopy latching mechanism was intact, and the forward and rear canopy latching pins were firmly attached to the frame. The mechanism was actuated and functioned normally. Flight control continuity from the control surfaces to the cockpit controls was confirmed through overload separations of the control system. The towline had broken free of the tow ring that was attached to the safety link, and the safety link remained attached to the glider. The towline release functioned normally during postaccident testing. An autopsy of the pilot was performed at the Douglas County Morgue, Omaha, Nebraska. The pilot's cause of death was blunt force trauma to the head. No significant natural disease was identified. Toxicology testing performed by Axis Forensic Toxicology at the request of Douglas County identified gabapentin (3.2 mcg/ml), caffeine, and cotinine in heart blood. Toxicology testing performed by the Federal Aviation Administration (FAA) Bioaeronautical Sciences Research Laboratory, Oklahoma City, Oklahoma, identified gabapentin in heart blood and urine, metoprolol in heart blood, and naproxen in urine. Gabapentin is an antiseizure medication that is also used to treat chronic nerve pain; it is often marketed with the name Neurontin. It carries a warning that it "may cause dizziness, somnolence and other symptoms and signs of [central nervous system] depression." Caffeine is a stimulant found in coffee, tea, and colas. Cotinine is a metabolite of nicotine, which is found in tobacco products. Naproxen is an over-the-counter analgesic; it is not considered impairing. Metoprolol is a blood pressure medication and is not considered impairing. The glider pilot was not required to and did not hold an airman medical certificate. Records from the pilot's visits to his primary care physician between May 2014 and May 2017 indicated that he had an ongoing history of migraine headaches, high blood pressure, high cholesterol, pre-diabetes, and eczema that were controlled with medications. On September 1, 2016, he was seen by his primary care doctor and diagnosed with a pinched nerve in his neck (cervical radiculopathy). At that time, he was started on gabapentin with instructions to increase slowly to 300 mg three times a day and to watch for sleepiness as he did so. The pilot sent the doctor an email, dated November 1, 2016, describing the way he increased the dose and reporting "no notable side effects." He remained on this dose through his last physician visit on April 20, 2017. At that time, he was also documented as using lisinopril and metoprolol for his hypertension and pravastatin for his cholesterol; lisinopril and pravastatin are not considered impairing. The pilot's logbook contained an entry dated May 30, 2014, which stated that the accident glider's canopy came open, and the takeoff was aborted. The FAA inspector stated that according to the pilot's wife, the pilot consulted with a mechanic who suggested lubricating the canopy latching mechanism. There was no maintenance logbook entry showing that the latching mechanism was lubricated, and lubrication was not part of the glider manufacturer's maintenance and inspection procedures. "... if the canopy opens unexpectedly during any phase of flight, the first duty is to fly the glider. It is important to maintain adequate airspeed while selecting a suitable landing area. If the canopy opens while on aerotow, it is vital to maintain a normal flying attitude to avoid jeopardizing the safety of the glider occupants and the safety of the towplane pilot. Only when the glider pilot is certain that glider control can be maintained should any attention be devoted to trying to close the canopy. If flying a two-seat glider with a passenger on board, fly the glider while the other person attempts to close and lock the canopy. If the canopy cannot be closed, the glider may still be controllable." On May 13, 2017, about 1520 central daylight time, an experimental racing AS+ LTD AC 4 glider, N358R, impacted terrain after the canopy had opened during takeoff at Blair Municipal Airport, Blair, Nebraska. The glider sustained substantial damage. 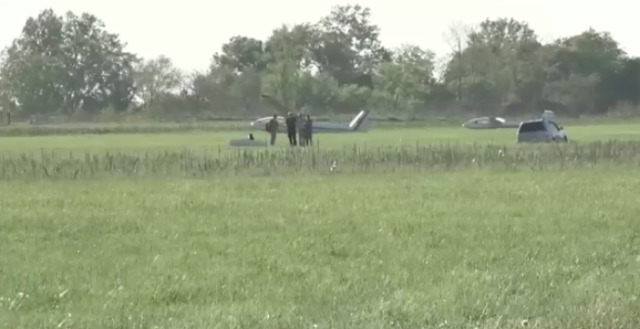 The private pilot received fatal injuries. The glider was registered to and operated by the pilot under 14 Code of Federal Regulations Part 91 as a personal flight that was not operating on a flight plan. Visual meteorological conditions prevailed at the time of the accident. The local flight was originating at the time of the accident.